From hot and hearty lasagna to creamy and rich fettuccine Alfredo, many pasta dishes are considered quintessential comfort foods. And the good thing, for people who are watching their waistlines and caloric intake, there are just as many healthy pasta dishes that showcase incredibly fresh ingredients that offer many health benefits. There are several ways for you to enjoy healthy pasta dishes. Instead of using “regular” pastas, you can use whole wheat pasta varieties. And you can use farm fresh ingredients such as spinach, peppers and zucchini. For a quick and healthy pasta dinner, cook 1 pound of whole wheat pasta according to package directions. While pasta cooks, heat 1 tablespoon extra virgin olive oil in a large skillet over medium-high heat. Saute 1 sliced onion. Add 1 (14-ounce) can drained tomatoes; simmer for 10 minutes. Stir in 1 pound of frozen spinach; heat through. Drain pasta and then toss with the sauce; season with salt and black pepper. Sprinkle 1/3 up feta cheese atop pasta before serving. Other great healthy pasta dish ingredients include arugula, asparagus, bell peppers, cherry tomatoes, cucumber, herbs, kalamata olives, lemon juice, olives, rotisserie chicken breast and more. 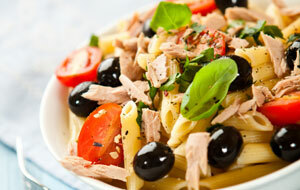 And, of course, if you must indulge in pasta dishes chock-full of comfort then simply reduce your portion size. A little bit goes a long way!